The basic idea behind the cable is to use a CAT5 or CAT5e computer cable to carry the video signal. 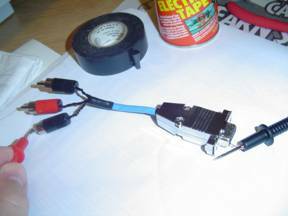 The cable is pretty easy to make if you have some basic soldering skills. Works for distances up to 50'. Full credit for this idea goes to MrWigggles on AVSforum, in this thread. A couple of assumptions here, the projector has a 15 pin VGA style video port on it. If it has 5 BNC connectors instead, then the recipe changes a bit. You must use three pairs for R, G & B, and split the fourth pair for H&V, each connected to a BNC. I've attached a picture of a VGA connector. You will need two male connectors with hoods. I recommend the metal hoods. You can get them at Radio Shack or any decent electronics parts store. You will also need a length of CAT5 or CAT6 computer network cable. The shielded variety (STP) is supposed to work better than the unshielded (UTP) but the UTP is much more common. I used UTP and got good results. Here are the pin outs. A CAT5 cable has 8 conductors in 4 color coded pairs. The ground connections are all common and the DDC DAT is for plug and play detection and likely won't work with your projector any way. I've added what CAT5 conductors I used for what pins in the table below. The same connections on both ends. I recommend checking all of your connections, from pin to pin, for continuity with a multimeter. You may need to use a short piece of wire (a strand from the CAT 5 cable will work) to reach into the pin sockets. Copyright © 2001-2007 C.M.Collins. All rights reserved. This method can also be used to make a good component cable can be made from CAT5. I had someone ask me if it would work. I thought is should work great, so I made a 50 foot cable and it did! The person who asked about it is now using the 50’ CAT5 Component cable with his Infocus X1 DLP projector. Just use three of the four pairs, one each, for Y, Pr, and Pb. Untwist the pairs as little as possible and solder on an RCA connector to each end, one conductor to the center pin and the other to the shell. I added some shrink tubing to the pairs to give it some extra strength, but this is not required. Total cost was about $10, with the cable from Lowe’s and the RCA connectors from Radio Shack. Useful link: Video over UTP from Extron. 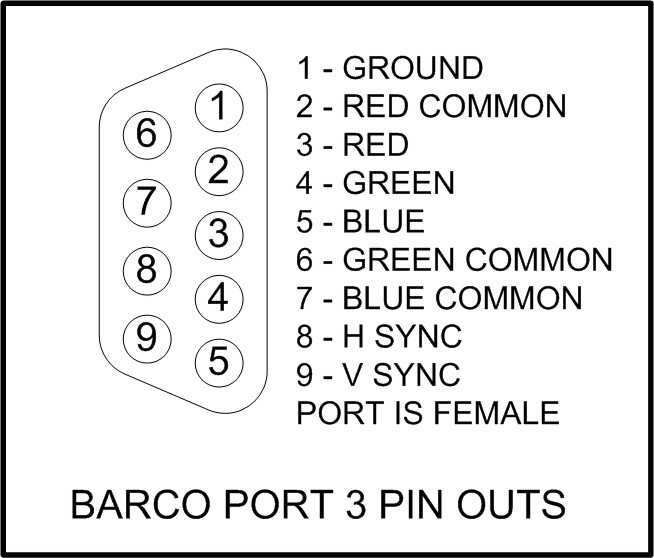 To interface to the 9-pin RGB Port 3 on a Barco CRT projector, use these pin-outs. 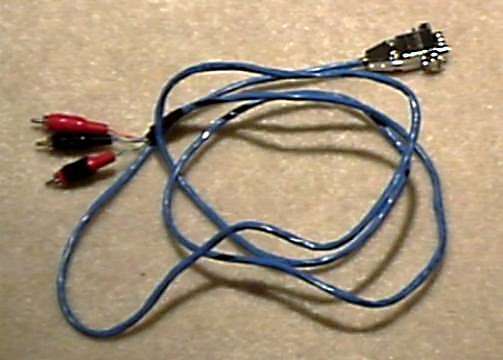 The diagram below shows the how to use this method to make a VGA (HD-15 connector) to component breakout cable. This cable is used to connect a component video source such as a DVD player or Satellite/Cable receiver to a projector, RPTV, LCD or Plasma that accepts componet video via an HD-15 port. In some models, you will have to set this input to "component" via the menu system, others will auto-sense the input. 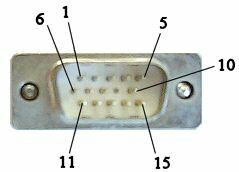 Component adapter for 15 pin VGA/Component input, see diagram below. What parts should I use to build the adapter/cable? Will I be able to use the VGA to component adapter to watch DVD's from my DVD player on my computer monitor? Probably not, the adapter just "adapts" it doesn't convert. Nearly all computer monitors need an RGB signal, as compared to the component (Y, Pr, Pb) signal that a DVD player outputs. To view a component signal on an RGB monitor requires a transcoder, which converts the component to an RGB signal. 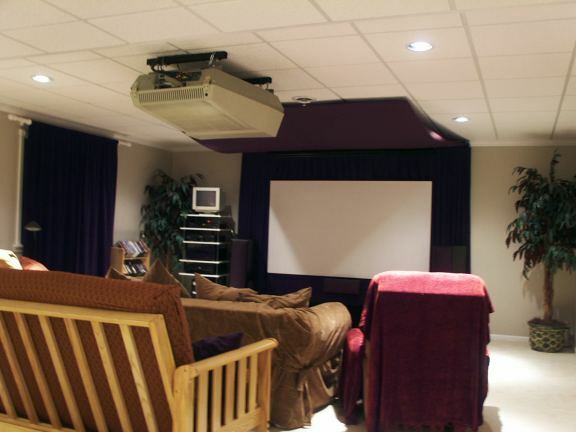 Many projectors and some rare monitors will accept a compent signal via their HD-15 (VGA or RGB) port. This is the intended use for this adapter. Bottom line: For the adapter to work your display device must accept component inputs. Will I be able to use the VGA to component adapter to watch my computer on my big screen TV? You can connect your PC to your wide screen TV if either the TV has an RGB (HD-15 or 5 RCA) input or if your computer can output its signal in component. Some video cards can do this natively (some ATI) or via a "dongle" (most Radeon cards), some NVIDIA cards have component output also. Bottom line: you'll have to check the specs of your video card. If there is no RGB input on the TC or component output from the video card, you'll need to get an RGB to Component transcoder, or scan converter (really two names for the same thing). - VGA to VGA; a cable with HD-15 connections using VGA pin outs on each end. - Component Video to Component Video; 3 RCA connectors on each end. Uses only three of the four CAT5 pairs. Connect as shown in the adapter picture, above, on both ends. Useful for long runs from a DVD player to an RPTV or similar display. - HD-15 to Component: The adapter detailed above and pictured below. - Analog audio; Build like component to component, can carry up to two stereo pairs. RCA connectors on each end. Useful for connectiing remote powered subwoofers or powered speakers to a receiver's line level outputs. -1/8 inch stereo audio to RCA audio; useful for connecting PC sound card analog audio outputs to a stereo or A/V receiver's inputs. What exactly should I do with the Brown/Brown-White cables on the VGA to Component adapter? These unused pairs could be used for mono analog audio or possibly coaxial digital audio by attaching more RCA connectors, otherwise you can just leave them, cut them off, or tape them back. Can I use these techniques to build a long S-Video Cable? Blue & Blue/White, Brown & Brown/White are not used These unused pairs could be used for left and right audio or possibly coaxial digital audio by attaching more RCA connectors. Can I use these techniques to build a SCART to VGA Cable? Not exactly. SCART connections use RGBS (Red, Green , Blue and Composite Sync) which has horizontal and vertical sync signals on the same pin. VGA uses separate sync lines. To accomplish this your display must accept RGBS signals, or you must use a sync separator. If anyone has successfully done this, I'd love to know what you did. I don't have any SCART devices to test with. Can I use these techniques to extend an HDMI connection? Sort of. You can use CAT5 or CAT6 cabling to extend an HDMI connection, but you'll need adapters, they are pretty easy to find (click to search). Be aware that these take two cables and are good up to about 100 ft (30M). Active ones can go further but are a lot more. These are useful if you already have CAT5 cabling installed and want to distribute audio and video. They can transmit through patch panels and cables, but total length is still limited. Short Component to VGA adapter being tested for continuity, Built by Cory.